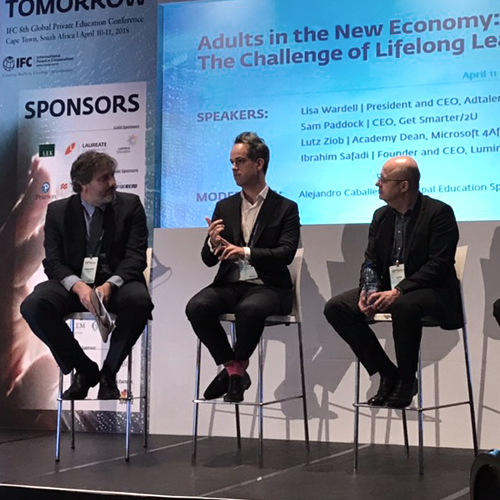 “As we move into the fourth industrial revolution, new ways emerge for technology to shape higher education,” said Alejandro Caballero, Principal Education Specialist, at the International Finance Corporation (IFC) 8th Global Private Education Conference in Cape Town. This was the first time the IFC hosted their Education Conference in Africa and approximately 500 education industry executives from all over the world, were in attendance. The lifelong learning topic emerged based on the US Bureau of Labor Statistics report that working professionals born around 1957-1964 held on average 11.9 jobs from age 18 to age 50 – where almost half of those jobs were held between ages 18 to 24.1 That’s close to 10 different jobs before the mere age of 40. Lisa Wardell described how technology is a primary driver of the need to upskill and innovate in one’s professional space. She also mentioned the field of learning science – a discipline focused on the scientific understanding and research of learning and pedagogy, in the hope of implementing improved learning methodologies in the education sector. The new workforce is dominated by a demand for flexibility, upskilling, reskilling and adaptability to change. It’s now the time where lifelong learning is being embraced more than ever before if working professionals hope to keep up with the technology-driven environment. The private education sector comes in as a response to both the challenges and opportunities that arise out of this movement towards creating lifelong learners. Sam Paddock went on to say, “We have a meaningful number of students worldwide who want to develop skills in blockchain, fintech, cryptocurrency and the like, and we are finding a way to fill that gap”. However, the guest speakers all agreed that technology is not reaching its full potential in the education environment, due to lack of confidence, and guidance. Lutz Ziob described how technology is being underestimated when people say it will never replace brick and mortar learning, while it is being overhyped or overestimated when online learning is made to be easily accessible, and people assume this is going to solve everything. Linking back to learning science, if educators make use of the data gathered from a variety of disciplines like cognitive science, motivational psychology, behavioral economics, and others, studying the way in which people learn – these private education industries will be able to effectively create curriculums and environments where students are more likely to succeed in their lifelong learning journeys. Are you ready to embrace the journey of a lifelong learner?